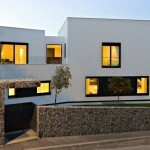 3LHD Architects have designed this house in the city of Zagreb, Croatia. Pantovcak, one of Zagreb’s most prestigious streets, which rests below the gaze of Sljeme, has been lined with freestanding family houses for decades. With its sculpted gardens and comfortable spaces between buildings, it exudes all of the admirable qualities of a pleasantly livable urban residential drive. House N is situated in a quieter secondary neighborhood on this street, perched in the western hills and boasting a delightful panoramic view of the forest and the city. Access to the landscape from the southern side, including a relatively narrow steeply sloping and elongated plot, was the key element that defined the position and layout of the house. Originally there was a substandard house on the plot. It did not satisfy the needs of the client and thus had to be replaced. The new family house for three people had to accommodate modern residential conveniences, such as a wellness and a fitness hall. The house is situated at the highest and front most point of the plot, in order to take the best advantage of the inspiring view of the city below. Close proximity to neighboring buildings on the eastern and southern borders of the lot influenced the house’s relatively compact design with a reduced number of openings in these two façades. 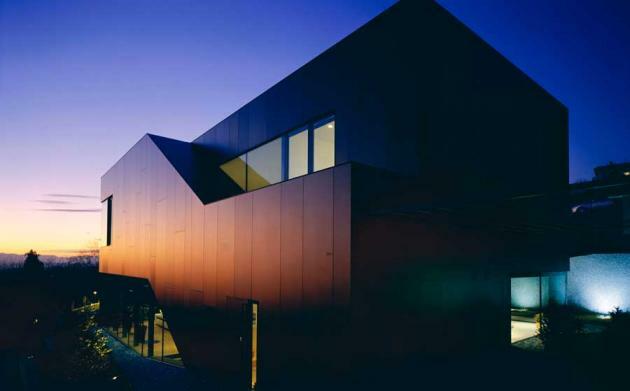 The limited width of the lot was compensated for by extending the building in the lengthwise bearing – down a slope that was utilized in such a manner as to add a third story. Directions of movement in the interior were additionally accentuated within the external volume of the house and represent its main design element. 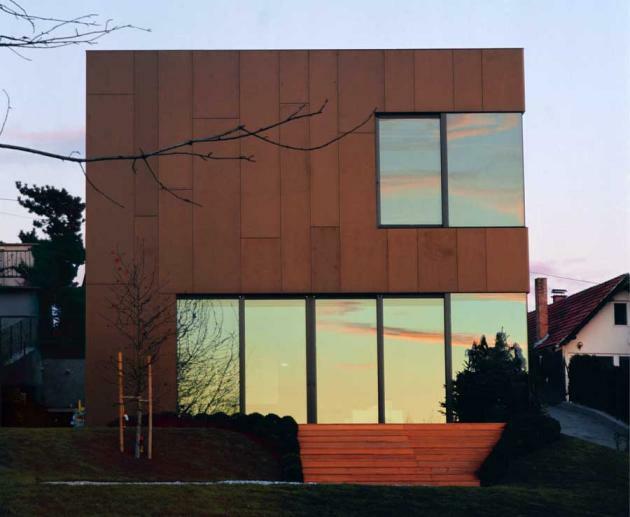 The entire house, its façades and the roof are covered with the same material, dark brown HPL panels, which, in contrast to large openings, make its volume more compact. The ground floor consists of a living area, which extends to the outer environment through wooden terraces, some of which are roofed over, while others are open to the sky, winding up in completely natural pebbled areas amid grass. 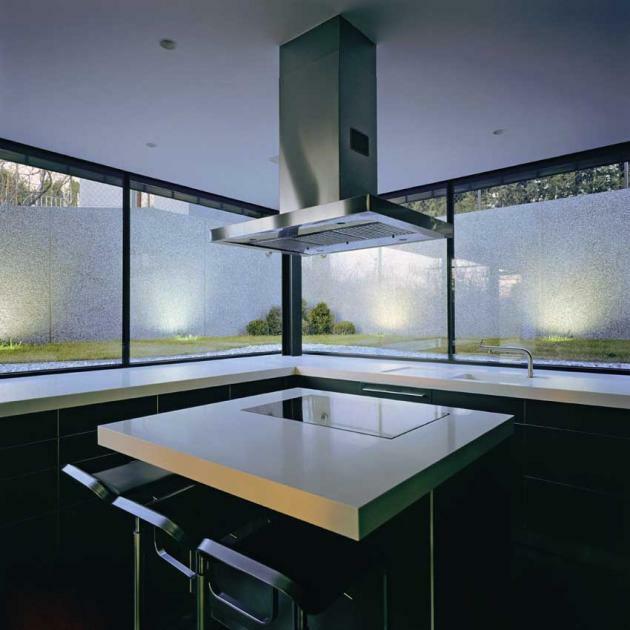 Unlike the living room and the dining area, contact between the kitchen and the exterior is not as direct. Nevertheless, the placement of the kitchen in an otherwise unfavorable position in relation to neighboring homes and the surrounding terrain was auspiciously counterbalanced by the introduction of a broad corner window set level with the garden lawn. Hence the work surface, placed alongside the window, appears to stretch out toward an open expanse of the garden. The unfortunate position of an access road running alongside the entire length of the plot makes opening from the living room area to the most desirable southern vantage impossible. 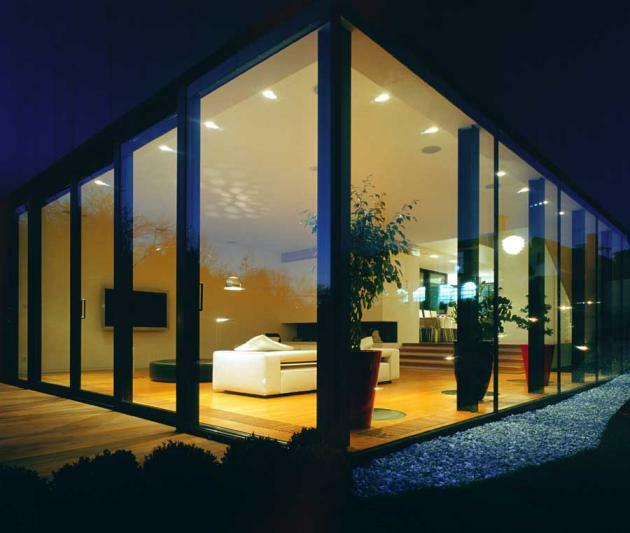 Consequently the southern area is modestly covered in a triangular glass shell that rises towards the southwestern corner and connects to the expansive glass surfaces of the western part of the house which are wholly open, thus connecting the living room with the garden. 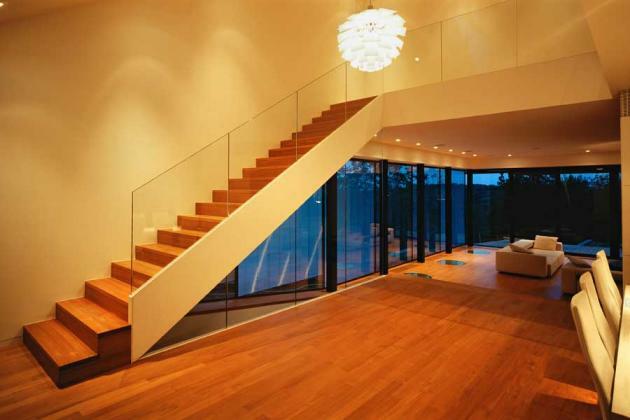 The main accent in the interior is a wide two-floored hall that signifies the main connector of the ground and first floors. It is dominated by a hanging Poulsen “artichoke” bathed in diffuse zenithal lighting that comes from a high main window and gives the entire area a unique atmosphere. 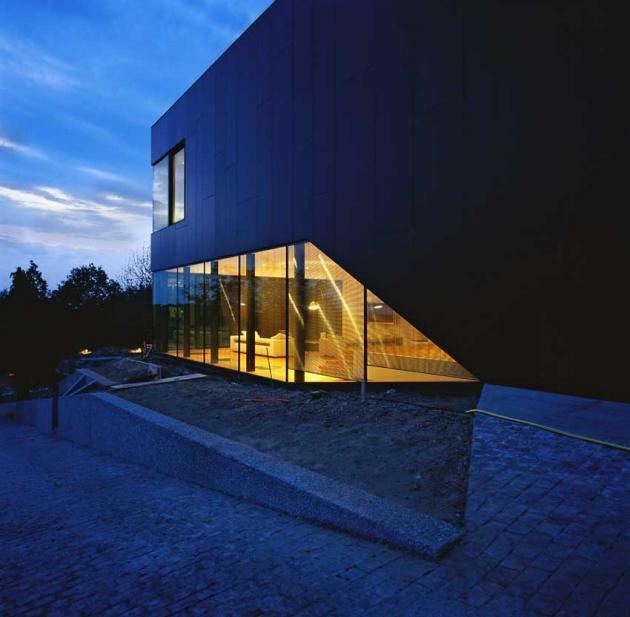 The first floor consists of intimate areas; a work area, parent and children’s zones, from which one may take in a most breathtaking view through a corner window. Built-in closets on each story have been integrated completely into their surroundings with color and materials, thus enabling a minimal amount of visible and movable furniture. 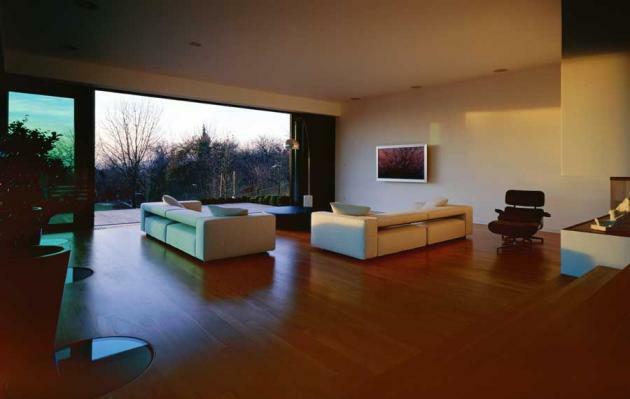 Floors of oiled teak and white walls create a respectable foundation for any color intervention which might take place in the future. Special attention was given to the lighting of the rooms. 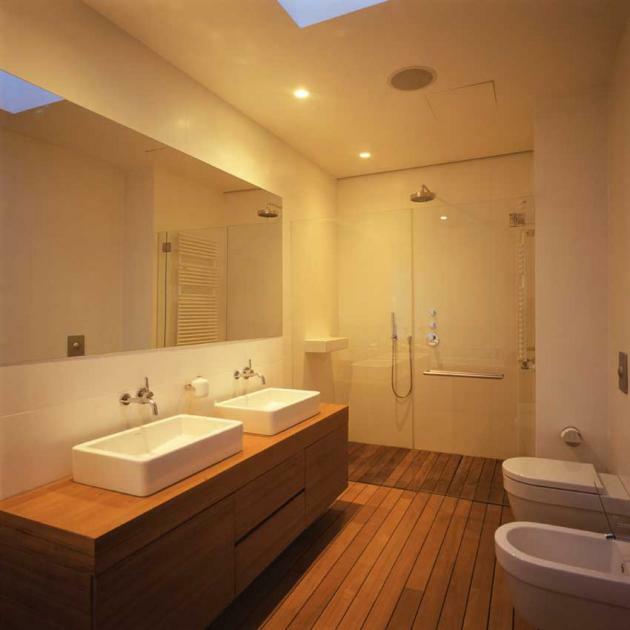 Toilet and wardrobe areas are lighted with roof lights in order to provide them with as much natural and superior quality illumination as possible. The fitness room is situated in the basement and gets its only source of light through round glass ceiling lights placed along the southern glass surface of the living area floor. This position was also assigned for the placement of larger house plants in order to create an additional visual barrier towards the street. The boiler room, wellness area and wine cellar are also in the basement. All lights are incorporated in a lowered ceiling that hides heating and air-conditioning systems, which are vented from fan coils in wardrobes and floors throughout the house. At the very bottom of the sloping lot, there is a two car garage, which is buried in the land and hidden from view of the house. The entire slope maintains the natural look of a grass meadow with meandering stretches of thicker greenery. Original tall shade trees and fruit-bearing trees, along with an alley of cypresses, were preserved along the access road to the garage. Sensitive contacts with neighboring plots and edges along the street were solved with concrete walls, while visible garage walls were treated with coarsely grained green-grey marble panels. 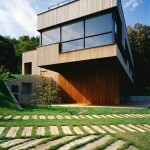 Walking areas and access paths to the house were covered with granite cubes. 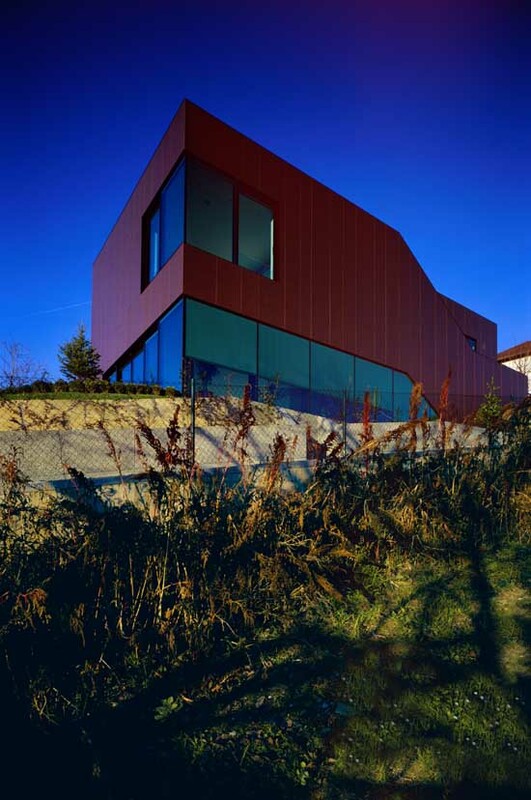 Simplicity and compactness of volume, a limited choice of materials and resultant colors in the end make the house look like a piece of fine dark chocolate placed atop a green meadow. 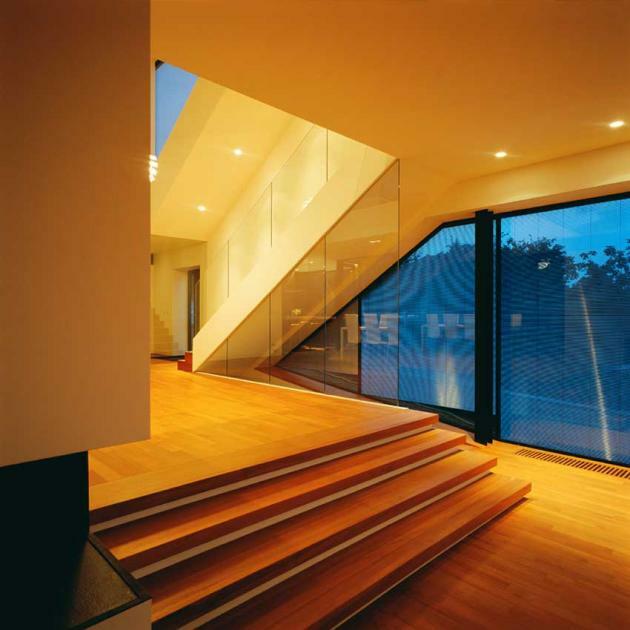 Visit the website of 3LHD Architects – here.